Kindle | Kate Mahar writes . . .
As a writer and lover of books, I’m so conflicted about technology and how we read books now. 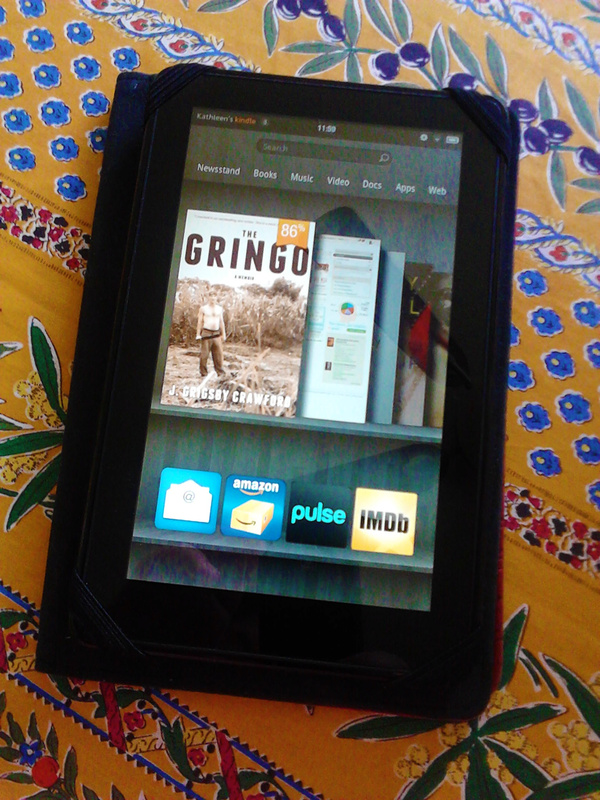 When I first got an e-reader, the Canadian Kobo brand, I vowed I’d only use it to read books when I travel. As a compulsive reader, when I knew I’d be spending many hours in planes and airports, I would pack three or four books to see me through a ten-day trip. That’s a lot of extra weight in your luggage! My son Chris actually forgot the Kobo in the seatback pocket on a flight from Paris to Rome (wow – how fancy pants does THAT sound?! If only we were truly the jetsetters that kind of comment might imply.). So for Christmas that year I treated myself to a Kindle Fire. And now, dear readers, I’m hooked. I still go to the wonderful Madison Public Library pretty regularly, but honestly? I’m afraid my days of buying actual hardcover or paperback books are over, at least when it comes to novels, memoirs, etc. – books you’re likely to read once, and that’s it. Now, a how-to book of any kind where you might want to flip back and forth and re-read sections, refer to directions, and so on, still works best in paper, at least for me. If I actually were to read the directions on my Kindle to learn how the bookmarks work, I might change my mind. However, at present, if I want to go back to search for anything on my Kindle I’m pretty much SOL. 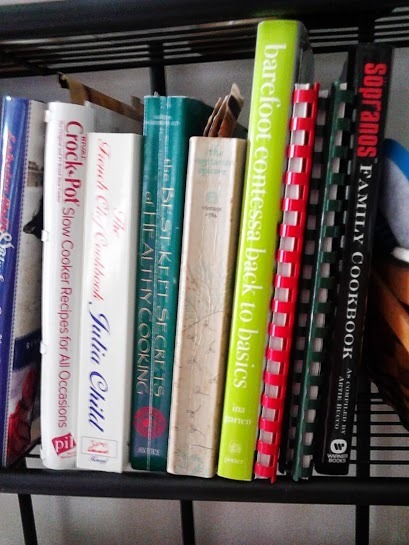 The exception to that rule, for me, is the cookbook. I am by no means a great, or even good, cook. I’m not especially inventive and I don’t find passing time in the kitchen experimenting with new recipes to be particularly entertaining. I’d usually rather read a book by Michael Ruhlman or Anthony Bourdain ,or perhaps watch a DVR’d’ episode of“Top Chef,” than puzzle out a recipe that, in my hands, may turn out to be inedible, anyway. Having said that, you won’t be surprised to learn that I haven’t cracked open a cookbook in ages. But . . . I am probably cooking more new foods than I ever have before due to television and the internet! The last time I bought a cookbook, I’m not sure the Food Network even existed. I definitely wasn’t on Facebook or Pinterest. Nowadays, if I try a new recipe, it’s because I saw something that looked amazing on TV (and then searched for directions online), or someone posted a recipe with a mouth-watering photo on Facebook or Pinterest (I am SO trying those Snickerdoodle muffins – thanks, Cindy W.!). And if I want to find out how to make something, I generally Google it and just choose whichever recipe looks good and appears to be within the feeble grasp of my limited culinary expertise. So are we fast approaching the point where actual, physical books will become extinct? While I sincerely hope that’s not the case, here I am with my Kindle. Here I am with a device that not only contains as many books as I probably have on the shelves in my living room, but that also allows me to hop onto the internet to refer back to projects and directions I’ve posted to Pinterest, or maybe even to search for a demonstration on how to make a decent pie crust on YouTube. But wait. There’s more. Here I am, writing to my heart’s content in a public forum. I have no idea how many (read: few) people read this, but regardless – it’s my creative outlet and I love doing it. I could be chit-chatting to myself in a journal that no one would read and no editor would ever publish, but instead, I can share this with you at no cost or risk to myself or a publishing house. I have to tell you, I’m really grateful for that. Thank you, WordPress! Thank you, anyone who is reading! But back to paper vs. screen, I’m still conflicted. As much as I love the physicality of books, I suppose that what matters is the essence of the material, the writing itself. I love interesting information, whether it’s the story of a young man’s experience as a Peace Corps volunteer in Ecuador (I’m reading that now: The Gringo by J. Grigsby Crawford) or how to train my dogs to sit and STAY (an ongoing process that requires much patience on my part). I am in awe of brilliant fiction. Here are just two novels I’ve recently read and loved: Wolf Hall by Hilary Mantel, and The Beautiful Ruins by Jess Walter (both purchased for my Kindle library, BTW). Does it matter if we read these things on paper or on a screen? Or is the important part simply the act of reading and loving the written word?